Plastic is an important and ubiquitous material in our economy and daily lives. It has multiple functions that help tackle a number of the challenges facing our society. Light and innovative materials in cars or planes save fuel and cut CO2 emissions. High-performance insulation materials help us save on energy bills. In packaging, plastics help ensure food safety and reduce food waste. Combined with 3D printing, bio-compatible plastic materials can save human lives by enabling medical innovation. However, too often the way plastics are currently produced, used and discarded fails to capture the economic benefits of a more ‘circular’ approach and harms the environment. There is an urgent need to tackle the environmental problems that today cast a long shadow over the production, use and consumption of plastics. The million tonnes of plastic litter that end up in the oceans every year are one of their most visible and alarming signs of these problems, causing growing public concern. A smart, innovative and sustainable plastics industry, where design and production fully respects the needs of reuse, repair, and recycling, brings growth and jobs to Europe and helps cut EU’s greenhouse gas emissions and dependence on imported fossil fuels. −Plastics and products containing plastics are designed to allow for greater durability, reuse and high-quality recycling. By 2030, all plastics packaging placed on the EU market is either reusable or can be recycled in a cost-effective manner. −Changes in production and design enable higher plastics recycling rates for all key applications. By 2030, more than half of plastics waste generated in Europe is recycled. Separate collection of plastics waste reaches very high levels. Recycling of plastics packaging waste achieves levels comparable with those of other packaging materials. −Thanks to improved separate collection and investment in innovation, skills and capacity upscaling, export of poorly sorted plastics waste has been phased out. Recycled plastics have become an increasingly valuable feedstock for industries, both at home and abroad. −The plastics value chain is far more integrated, and the chemical industry works closely with plastics recyclers to help them find wider and higher value applications for their output. Substances hampering recycling processes have been replaced or phased out. −The market for recycled and innovative plastics is successfully established, with clear growth perspectives as more products incorporate some recycled content. Demand for recycled plastics in Europe has grown four-fold, providing a stable flow of revenues for the recycling sector and job security for its growing workforce. −More plastic recycling helps reduce Europe’s dependence on imported fossil fuel and cut CO2 emissions, in line with commitments under the Paris Agreement. −Innovative materials and alternative feedstocks for plastic production are developed and used where evidence clearly shows that they are more sustainable compared to the non-renewable alternatives. This supports efforts on decarbonisation and creating additional opportunities for growth. −Europe confirms its leadership in sorting and recycling equipment and technologies. Exports rise in lockstep with global demand for more sustainable ways of processing end-of-life plastics. In Europe, citizens, government and industry support more sustainable and safer consumption and production patterns for plastics. This provides a fertile ground for social innovation and entrepreneurship, creating a wealth of opportunities for all Europeans. −Plastic waste generation is decoupled from growth. Citizens are aware of the need to avoid waste, and make choices accordingly. Consumers, as key players, are incentivised, made aware of key benefits and thus enabled to contribute actively to the transition. Better design, new business models and innovative products emerge that offer more sustainable consumption patterns. −Many entrepreneurs see the need for more resolute action on plastics waste prevention as a business opportunity. Increasingly, new companies emerge that provide circular solutions, such as reverse logistics for packaging or alternatives to disposable plastics, and they benefit from the development of digitisation. −The leakage of plastics into the environment decreases drastically. Effective waste collection systems, combined with a drop in waste generation and with increased consumer awareness, avoid litter and ensure that waste is handled appropriately. Marine litter from sea-based sources such as ships, fishing and aquaculture are significantly reduced. Cleaner beaches and seas foster activities such as tourism and fisheries, and preserve fragile ecosystems. All major European cities are much cleaner. −Innovative solutions are developed to prevent microplastics from reaching the seas. Their origin, routes of travel, and effects on human health are better understood, and industry and public authorities are working together to prevent them from ending up in our oceans and our air, drinking water or on our plates. −The EU is taking a leading role in a global dynamic, with countries engaging and cooperating to halt the flow of plastics into the oceans and taking remedial action against plastics waste already accumulated. Best practices are disseminated widely, scientific knowledge improves, citizens mobilise, and innovators and scientists develop solutions that can be applied worldwide. 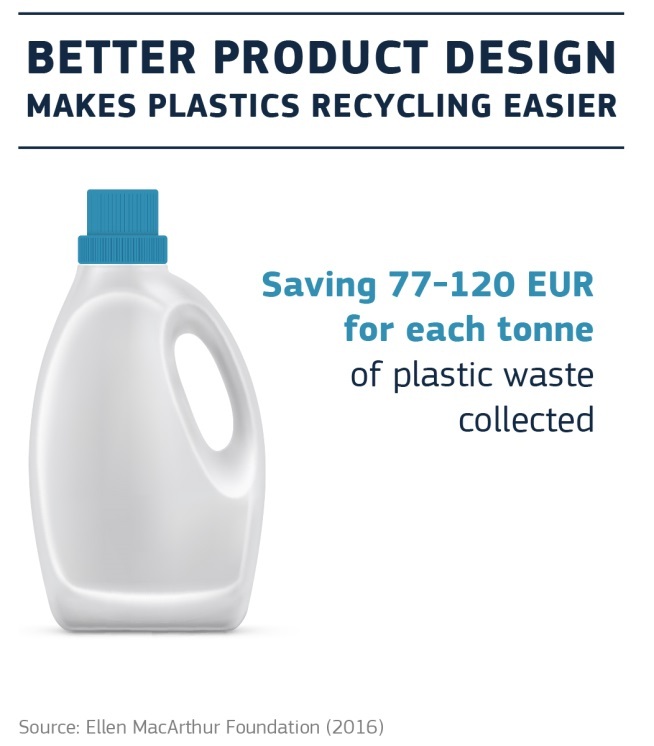 −create viable markets for recycled and renewable plastics.